My heart couldn’t help skipping a beat a couple of weeks ago when Linn’s Stamp News — the New York Times of stamp collectors — published a roundup story about upcoming stamps. With little elaboration, the story mentioned that a set of stamps featuring science fiction writers was on the USPS schedule this year. Another source says there will be five designs in the set. Mierzejewski speculates at length about who might be the honorees. At one time the rule was no living person could appear on U.S. postage, but that rule was eliminated in 2011. Who do you want to see commemorated? There is an old comedy sketch where someone is chastised for blurting out, “Your cat is dead.” The fellow is told he should have led up to the bad news gradually – “Your cat is on the roof.” Then, “Your cat fell off the roof.” And finally…. That is what I want to do with this story, cushion the blow. Or am I simply guilty of buying into marketing hype here? Is it really news anymore when a comic book publisher kills off a superhero? That’s practically a regular part of every franchise’s lifecycle. These heroes don’t stay dead. Let’s not forget who Damian is: Although he’s halfWayne, he’s also half al Ghul. His mother, Talia, is the daughter of Ra’s al Ghul, one of Batman’s greatest foes. 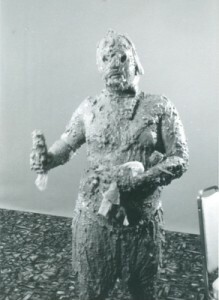 A man who has stayed alive for centuries using Lazarus pits. Lazarus pits that have the power to bring someone back from the dead. As unwise as it may seem for DC to kill Damian at all — let alone so soon — it’s even more unwise to think that we’ll never see him again. Oregon Science Fiction Conventions, Inc. and the World Horror Society have announced that the 2014 World Horror Convention will be held in Portland, OR from May 8-11. The headliners will be — Author Guests of Honor Nancy Holder, Jack Ketchum, and Norman Partridge; Artist Guest of Honor Greg Staples; Editor Guest of Honor Paula Guran; Ghost of Honor Edward Gorey; and Toastmaster Alan M. Clark. Membership sales will begin March 4, with voting for the WHC Grandmaster Award starting in the summer. Hotel bookings will be available June 1. The World Horror 2014 website is presently under construction. Online voting has begun for the 11th Annual Rondo Hatton Classic Horror Awards. There are 35 categories — click the link to see the nominees for the best in the horror genre from 2012. The website is fun to browse in its own right because some of the categories are illustrated. 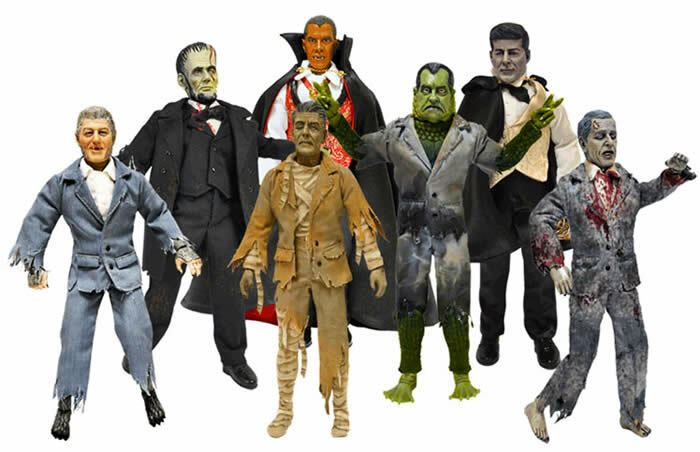 For example, up for Best Toy, Model or Collectible is this set of action figures called the Presidential Monsters, with Baracula, Zom-Bush, Wolf Bill and Lincolnstein. Any fan can vote. Send an e-mail containing your name and your picks to David Colton (taraco at aol.com) by April 7.
jan howard finder (“Wombat”), one of fandom’s great characters, died February 25 at 12:54 a.m. in Albany Medical Center Hospital CCU from renal and liver failure. He had been battling prostate cancer for several years. He was a conrunner, costumer and Tolkien fan. He toured New Zealand’s LoTR film locations in 2004 and 2006, and bent every effort to get Guillermo del Toro to agree to put him in The Hobbit when the director was still attached to the project. Appropos of his nickname, jan’s best-known publishing project was Finder’s Guide To Australterrestrials, a 28-page collection of sketches of antipodean creatures done by sf and fan artists. jan was a guest of honor at the 1993 Worldcon, ConFrancisco. Update 02/26/2013: Corrected attribution of quote. “Leadbeater’s Possum,” by Katherine Wadey for Finder’s Guide To Australterrestrials. Eligible voters have until March 10 to nominate for the 2013 Hugo Awards. Those who had Supporting or Attending memberships in Chicon 7 (the 2012 Worldcon), or joined LoneStarCon 3 or Loncon 3 (the 2014 Worldcon) as a Supporting, Attending, or Young Adult member by January 31, 2013 may cast a nominating ballot. Electronic voting is an option – see details here. Ballots must be received by Sunday, March 10, 2013, 11:59 p.m. EDT. The Horror Writers Association has announced the finalists for the Bram Stoker Awards from the 2012 eligibility year. HWA active and lifetime members have until March 31 to vote for the winners, which will be announced on June 15. Tonight’s (February 25) Jeopardy! 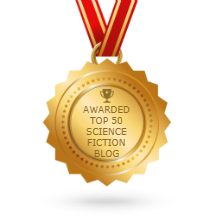 broadcast challenged players in its Tournament of Champions with a “Hugo Awards in Science Fiction” category during Double Jeopardy. Tonight’s contestants — unlike previous participants in other episodes of Jeopardy! –were able to supply the correct SF questions to match all the answers.